Yesterday, I set out to load the Hunter's Star Quilt top on the frame since the backing was loaded. This is what takes the most time for me. 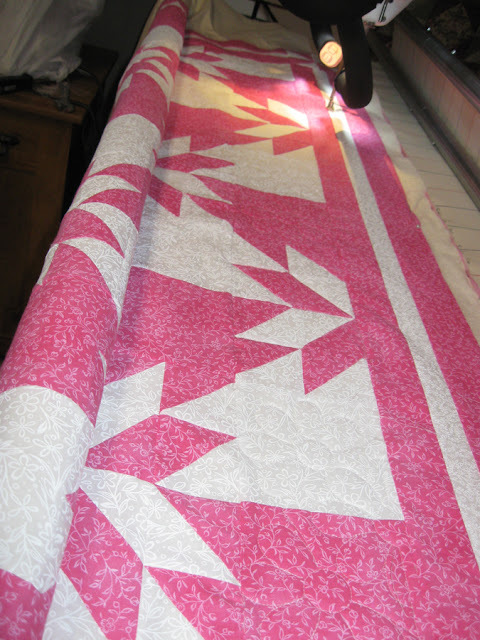 Making sure the quilt top is on straight since I float my quilt tops when I do quilt them. 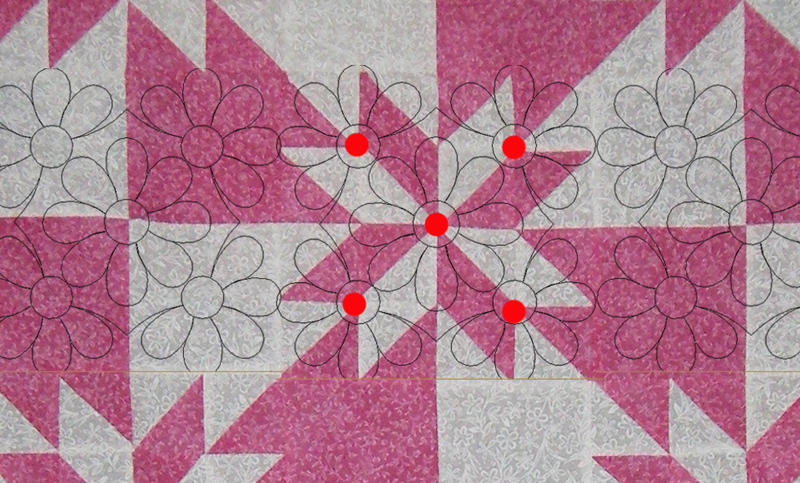 I set out determined to use the daisy quilt design referenced before and then outline the stars with a ruler. I ran into difficulty on the first half row of the quilt. The half daisy design went on great but the ruler work was somewhat of a nightmare. Where all the pieces of the star come together, it's pretty thick. The long arm hopper foot didn't want to glide over it. 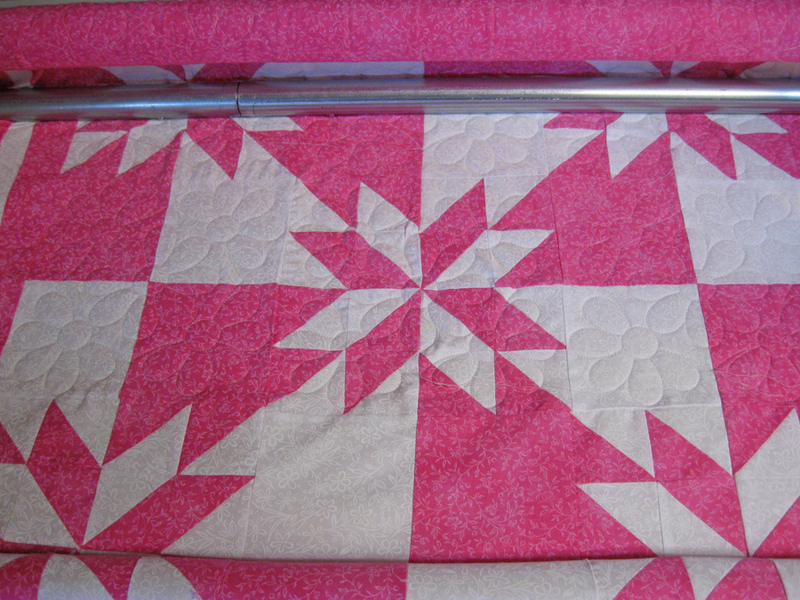 I fought with it but got the two half star blocks completed with straight ruler work. I just couldn't imagine what it would be like trying to do a full star and then also do one that was on top of the pieced backing. I'm sure it would be a struggle. At that moment, I made an impulsive decision to finish all blocks in the daisy design. It was the best impulsive decision I made. The circles on the daisies circled around the lumpiest center seams on the corners of the stars. It worked out much much better. Here's what the placement looks like in a photoshop image. The red dots show where the bulky seams were and how the circles went around them. 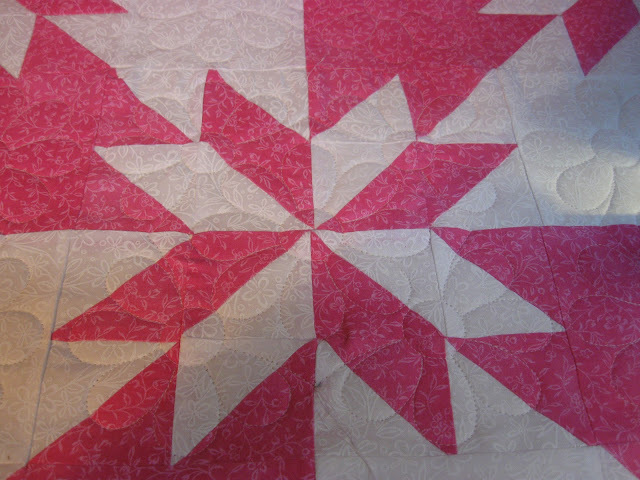 I left the first two half block stars as ruler work on both the top and bottom of the quilt. Hopefully it doesn't look too terrible. There's no way to know until it comes off the long arm. Now, on to the borders. I was going to do simple straight lines on my regular sewing machine. But, I decided to create a border design myself using daisies. I'm hoping it will take up some of the ripples that I saw appearing. I hope to finish it over the next couple of days.